A manager stuck doing everything is not going to be effective at anything. You’re bound to feel overwhelmed, frustrated, and lost. You may skip lunches and work late as you try to cram all of your responsibilities into your workday. This stress may manifest itself in both your professional and personal relationships. You may come across as stand-off-ish, impatient, or as having a “short fuse”. Aside from the fact that doing everything yourself will wreak havoc on your mental health, there’s a very logical reason to delegate to your employees: Because your boss is delegating to you. Your time and capacity is like a bucket. And that bucket can only hold so many tasks before it starts running over. Stress, lost lunches, and long nights are symptoms that you are approaching your bucket’s run off point. 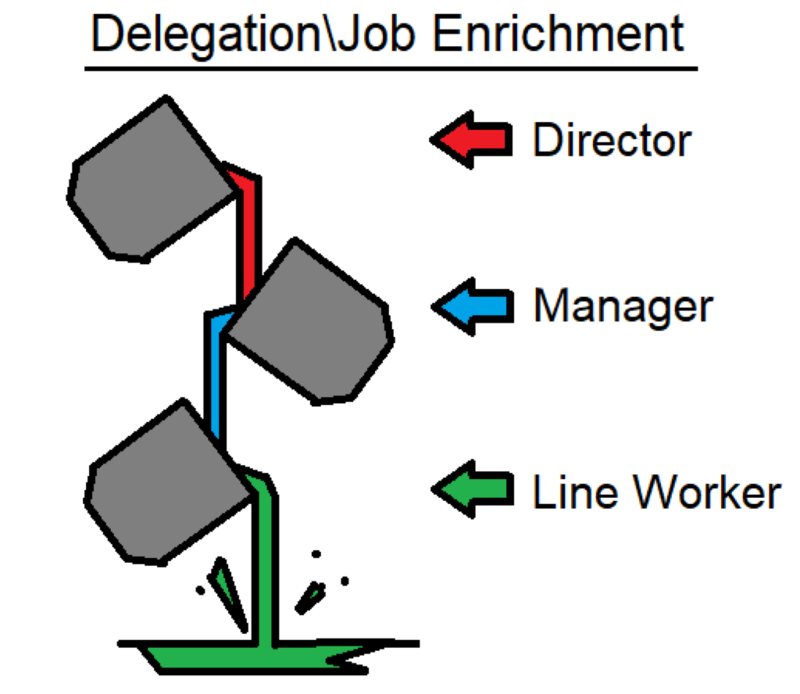 As this illustration shows, your boss (Director) is offloading work to you (Manager). It thus behooves you to offload work to your employees (Line Workers). Aside from the benefit that you will derive from delegating, your employees will benefit as well. Effective delegation will give them a chance to stretch their wings, and to gain new skills and knowledge that they may not be able to gain otherwise. It is a highly effective, and mutually beneficial form of professional development. My Employees Already have Too Much to do! In his book The Effective Manager, Mark Horstman observes that many employees spend time on non-essential tasks. He recommends that when your employees’ buckets get full, to allow the non-essential tasks to be eliminated – or, as he calls it, “delegating to the floor”. You’ll notice that I’ve shown this concept in my illustration above. If both you and your staff are over-worked, and you absolutely cannot hire more employees, then you may wish to have a candid discussion with your business leaders. There are bound to be some tasks that you simply must do yourself. Maybe it’s things like payroll, budgeting, invoicing, etc. However, for every task that you must do yourself, there are likely several things that you can reasonably delegate. Should you delegate those things? YES! Delegating is simply, but easy to get wrong. For example, if you delegate a management task to an employee who has absolutely no interest in management whatsoever, you may find that the tasks aren’t getting done on time, or with due care. Don’t worry about who you would delegate to, at this point. Just list the things that someone else can do. You may find that the Pareto Principle applies here. That is, roughly 20% of your tasks absolutely must be done by you, wile around 80% can be reasonably delegated. This list you make will tell you what to delegate. In order to do this, you’ll need to understand the interests, ambitions, and motivations of your employees. You can get this information by holding employee-lead one-on-ones. Knowing this information will help you match the delegate-able tasks to your employees. Basically, it tells you who to delegate to. It’s probably a good idea to give your employees a head’s up before you go marching into Jen’s office and informing her that she’s now responsible for creating the TPS Reports. I recommend holding a short and small meeting with your employees, and letting them know your plans. Express sincere appreciation for their hard work thus far, and let them know that you would like to give them some new responsibilities that you hope will provide meaningful professional growth and development. Do to the nature of your delegation (i.e. that you’re delegating relevant and growth-focused tasks) you may choose to do the delegation in the closing 10 minutes of your employee-lead one-on-ones. The talking points will be very similar to the meeting you held earlier. Express sincere appreciation for their hard work, and present the delegated tasks as opportunities for professional growth. These concerns are valid. At least in the beginning, your employees probably won’t do the job as well as you can, and they may have difficulty properly prioritizing the tasks you delegate. However, if you’re skipping lunches and working weekends to get all of your tasks complete, the odds are that you’re not doing a very good job yourself. It’s not okay to be over-bearing, or to turn into a micro-manager. But it is okay to check your employees’ work from time to time, and provide minor course corrections as they continue to adapt to their new responsibilities. Don’t be afraid to delegate. I’ve counseled some leaders who had a hard time letting go of the “if you want something done right you have to do it yourself” mentality. In leadership, that mentality will grind you to dust. Delegate everything you can. Realize that your employees aren’t going to do the job the exact same way that you do, and that’s okay. They’ll improve over time. Provide guidance as needed, but trust them to do the work. You’ll be doing yourself and them a huge favor by effectively delegating.